Essentials: Highlighter/Blush Compact. Beauty Blender. Cheek Palette. Almond Coconut Honey Bath. Philosophy Hollyberries Set. Lancer Skincare. Dry Shampoo. Eye Cream. Fragrance Set. Gift Ideas: Nail Polish Set. Silk Pillow. Eye Shadow Palette. Brush Set. Hair Treatments. Body Cookie Ice Cream. Screen Wipes. NuFace Anti-Aging Device. Beauty lovers rejoice because it’s your favorite time of year; Sephora’s VIB holiday shopping event is in full swing! From November 4th to November 7th VIB Rouge members get early access to the sale and can take 20% off their orders with code 20ROUGE both online and in stores. VIB members gain access to the sale November 11th through November 14th and can take 20% off with code 20VIB both online and in stores. 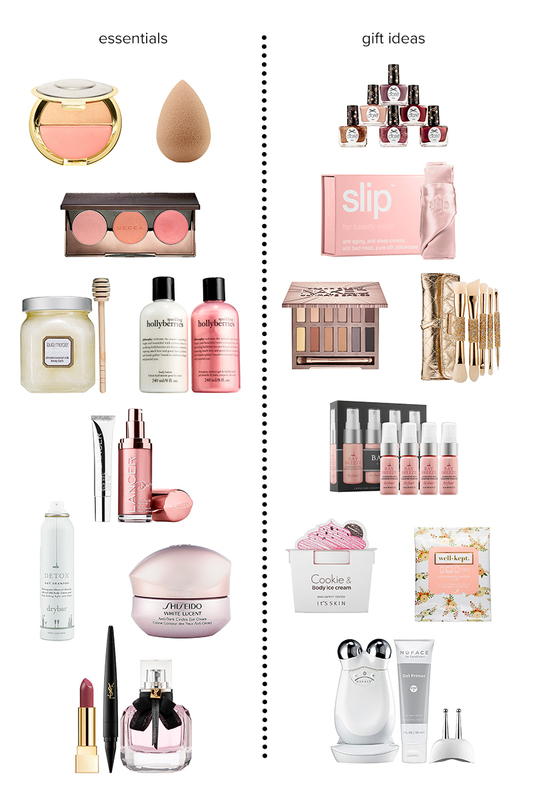 I’ve put together a collage of beauty products for both you and your loved ones. Whether you’re stocking up on essentials or purchasing your holiday gifts ahead of time, I think I have you covered. Let me know if I’ve missed any treasures… And if you shop, share your goodies with me!